PDC Members Kim, Jonah, Norm & Bob w/ John James Playing "Hangman's Reel"
YOU TUBE VIDEO: PDC members interviewed by Monroe County Historical Society. In MARCH, Kim took us through some familiar and not-so-familiar Irish tunes in honor of St. Patrick’s Day. This month, APRIL, we prepare for our upcoming (soon!!!) festival and Jonah will lead us in one or two new tunes + Kirby! (see tab page) …and then some jamming. We look forward to seeing you. 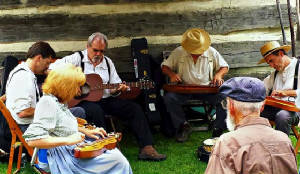 17th Annual Pocono Dulcimer Festival – April 26-27! pre-register by this Friday, April 5th and save 20%!! Volunteers needed Friday (26th) evening to stuff folders, set up classrooms and join the jam! Here are a few of the tunes we play and we're learning more all the time. Bile Dem Cabbage w/ B part, Black Mountain Rag, Angelina Baker, Rock the Cradle Joe, Camp Meeting on the 4th of July, Barlow Knife, Little Liza Jane, Bonaparte Crossing the Rhine, Bonaparte's Retreat, Erin's Kitchen Table, Pretty Betty Martin, Sadie at the Back Door, Old Rosin the Beau, Arkansas Traveler, Down the River I Go, Hard Times , Holy Manna, I'll Fly Away , Little Bitty Man, Midnight on the Water, Sandy River Belle, Over The Waterfall, Pretty Little Girl with the Blue Dress On, Sheepy and the Goat, Shepherd's Hey, Simple Gifts , Soldiers Joy, Southwind, Spotted Pony, Spring Creek, Mes Parent, Egan's Polka, John Ryan's Polka, Grey Squirrel Eating up the New Ground Corn, White Creek Pass, Pocono Hornpipe, Spring Creek, and many more! Come join us - new players are always welcome. If you have an observation, opinion or criticism to share, send your thoughts to us to help us improve our Club and our festival. If you would like any of our members to perform for you or your organization please let us know and we'll be happy to arrange for that.